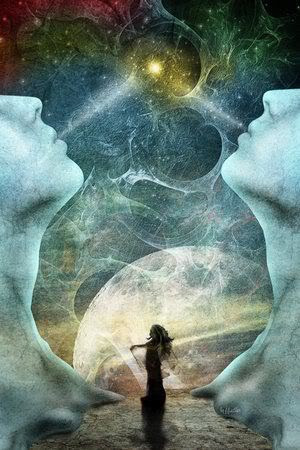 Twin souls love each other so much that their energies reflect and mirror everything within. They are showing you something that you are, already have been, or forgotten about yourself that needs to be seen. Just look at their wants, beliefs, and what they have to say. These are your own needs and beliefs being reflected back at you. Twin soul love takes you through a spiritual trip that no one else can create for you. Your partner is showing you things from within the deepest love possible and leading you back to your own source, by mirroring everything about you. The energies between twin souls are taking over (even in words, actions) to show you who you are or what might be in need of transformation. Leda is Healer, Coach, and writer. She coaches twinsoul and soulmate partners, or individuals who are in this journey. To make an appointment for a healing or coaching, hit the ‘contact button’. You are more then welcome with me. Leda is writer, speaker, journalist and Coach of the New Energy. She specializes in Add/HSP, twinsoul- and soulmate relationships, Karma cleansing, Regression-therapy, sustainibility, how to live in a healthy home, heart-activations and healing with new energetic tools.